In 1996 a life-long dream came true when Elmer was invited to perform with the Santa Fe Symphony in Santa Fe, New Mexico, 55 miles from my home town. I won't embarrass myself with an account of my deeply emotional response to hearing the master's music played by a live orchestra, but I will recount my brief meeting with the composer following the performance. My wife pulled me along like a child in tow as we planted ourselves in the line of fans hoping for a handshake or a picture with Elmer. When I finally stood before him, with shaky voice, I muttered something about how I had written him a fan letter when I was 14 years old, and that was about all I could get out. Elmer responded to this declaration with a puzzled look and paused uncomfortably until my wife calmly added "and you returned a very nice letter that my husband has framed on his wall at home." With this revelation, Elmer, in his engagingly animated way, waved his arm over his head in a mock swoon, relieved that he'd answered my fan letter. I then rather clumsily said I hoped that one day we'd get the score to "The World of Henry Orient," upon which he said, "wow, I'd almost forgotten that one." Several years back, the original pristine tape masters of the score to that film were discovered and released on the FMS label. It's one of my most cherished soundtrack CDs. Over the next several years I exchanged a few emails with Mr. Bernstein, first congratulating him on the release of his guitar concerto performed by Chris Parkening, which I'd heard on our local classical radio station. In one email, I told him how much I admired the theme to Love With the Proper Stranger, but could not find it anywhere. 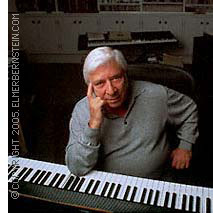 Two weeks later, a package arrived from Elmer Bernstein with a signed copy of his concerto and a double Neil Diamond CD, which contained a beautiful version of Love With the Proper Stranger arranged and conducted by the composer. I'm still astonished by this act of warm generosity by someone I've admired all my life. I really miss him.